How does infrared sauna benefit us? Infrared heat is simply a form of energy that is directly transmitted onto objects because of its specific wavelength. It has nothing to do with ultraviolet light which gives you sunburn and damages your skin. Conventional saunas need high air temperatures to pull impurities from the body, but infrared heated saunas can directly penetrate up to 45 mm inside the body. Impurities can be pushed out using lower and more comfortable temperatures. As the body temperature rises by infrared heat, perspiration occurs and blood circulation increases.The muscles and organs are stimulated and toxic waste (fat, heavy metals and other toxic materials) is removed from your body through perspiration. Far infrared (FIR), also known as radiant heat, is simply a form of energy that heats objects directly through a process called conversion. We cannot see this band of light with the naked eye, but we can feel this type of light in the form of heat. Our sun produces most of its energy in the infrared segment of the spectrum. Far infrared penetrates organic substances and water two to three inches so that the warming effect is very uniform. We live in a FIR temperature range. 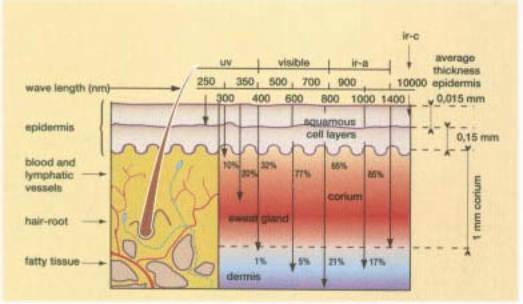 Our skin radiates 9.36-micron far infrared wave since our body temperature is 97.7 degrees Fahrenheit. This is very close to the resonant frequency of a water molecule. This makes perfect sense, since about 70% of our body is water. Among the energy spectrum coming from the sun, the far infrared waves are the safest and the most beneficial. Heaters in the infrared saunas radiate at 2-25 micron, making it completely compatible to the body. Infrared saunas are very economical. Infrared saunas have a warm up time of ten minutes compared to 20 to 30 minute warm up for a conventional sauna. Since far infrared penetrates the body, you are receiving the far infrared benefits even before the sauna warms up. You receive complete detoxification with the sauna set between 110 degrees to 130 degrees, making it comfortable to fully detoxify. Far infrared saunas work even with the door open, so it can be used with clothing on for a pre-warm up for exercise. They are portable and can be set up in 30 minutes or less, with six panels that are manufactured to fit exactly and held together with hex bolts. This makes them portable for use indoors or outdoors( if outdoors, it must be kept from the elements). Many doctors are using the Infra Red saunas in their practices for pain relief treatments. Infrared is approved by the FDA for treatment of pain relief and some insurance does co-payment for in-home saunas. Over the last 25 years, Japanese and Chinese researchers and clinicians have completed extensive research on infrared treatments and report many provocative findings. In Japan, there is an "infrared society" composed of medical doctors and physical therapists dedicated to further infrared research. Their findings support the health benefits of infrared therapy as a method of healing. There have been over 700,000 infrared thermal systems sold in the Orient for whole-body treatments. An additional 30 million people have received localized infrared treatment in the Orient, Europe and Australia. In Germany, physicians have used infrared therapy for over 80 years. Our body reacts to the increased heating through the natural cooling process of perspiring. Through the perspiration process, acid and waste residue like toxins, sodium, alcohol, nicotine, cholesterol and the potentially carcinogenic heavy metals are removed from the cells (especially zinc, lead, nickel, cadmium, etc). With the increased heat, the pores of our skin open and discharge waste products. As a result, the skin gradually sheds any old skin cells, leaving it glowing and immaculately clean with improved tone, elasticity, texture and colour. The Journal of American Medical Association (JAMA) states: "A moderately conditioned person can easily sweat off 500 grams in a sauna, consuming nearly 300 kcal, which is equivalent to running 2 -3 miles." This would be very valuable for those who don't exercise and those who can't exercise yet want an effective weight control and fitness maintenance program and the benefits of a regular exercise. Improves Skin and Heals Scars. Excellent for increasing blood circulation to the skin, which is essential for beautiful, youthful, glowing skin. Increased blood circulation has also been shown to relieve acne, eczema, psoriasis, burns, lesions and cuts. In addition, open wounds heal more quickly, reducing scarring. Even keloids may be gradually softened. Burns and other wounds or incisions may heal with significantly reduced scarring. As your body increases sweat production to cool itself, your heart works harder pumping blood at a greater rate to boost circulation, supplying the conditioning benefits of continuous exercise. Removes Toxins and Mineral Wastes. Effective for arthritis, back pain, muscle spasms, headache, sprains, strains, arthritis, muscle spasm and pain. The deep heat helps peripheral blood vessels dilate, bringing relief and healing to muscle and soft tissue injuries. Increased blood circulation carries off metabolic waste products and delivers oxygen-rich blood to oxygen-depleted muscle, so they recover faster. Muscles relax most readily when tissues are warm, for greater flexibility and range of motion. Sauna's deep heat raises your body temperature, inducing an artificial fever. As it works to combat the "fever," your body's immune system is strengthened. .
Cellulite is a gel-like substance made up of fat, water and wastes, which are trapped in pockets below the skin. Profuse sweating helps clear this form of unwanted debris from the body.